Two dreaded winter weather conditions are freezing rain and sleet. Countless commutes, road trips and walks across parking lots have been complicated by these headaches. In addition to being inconvenient, both can create hazards on roadways and walkways. Although they are both nuisances, there are differences between the two. Freezing rain and sleet form when liquid raindrops from a layer of warm air well above the surface fall into a layer of freezing air near the ground. Atmospheric conditions impact the outcome. 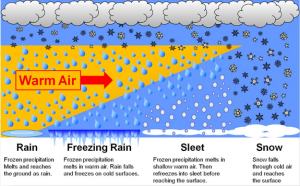 The thickness of the layer of freezing air determines which type of precipitation is formed. Freezing rain occurs when the atmosphere is too warm for snow. When the layer of freezing air is so thin that the raindrops do not have ample time to freeze, freezing rain is formed. The raindrops freeze on contact with the ground when the ground is at or below freezing. On roadways it is often called “black ice” because it can go unseen by drivers causing treacherous conditions. It can also form on contact with other surfaces such as trees, cars and power lines. 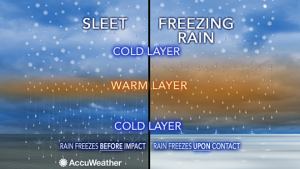 If the layer of freezing air along the surface is thicker, sleet occurs. The raindrops freeze before reaching the ground. 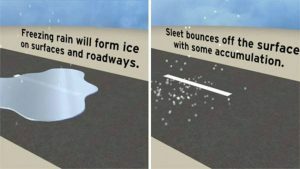 Unlike freezing rain, sleet bounces on contact with the ground instead of coating it. Sleet can accumulate like snow. Sure it’s annoying when sleet is pelting your face, but many experts believe the larger danger comes from freezing rain. As mentioned above, freezing rain coats surfaces. Yes it may be beautiful to see an ice coated tree but it’s also very dangerous. The weight is often heavy enough to bring down tree branches and power lines. Just a 1/2-inch accumulation on power lines can add 500 pounds of extra weight. Freezing rain is also sneaky. Since it falls as rain initially, its treachery can be overlooked. Often times motorists and pedestrians don’t even know that it has formed until they’ve lost control of their vehicle or taken a fall. Freezing rain is also harder to get rid of than sleet. Unlike sleet, it cannot be plowed and pushed out of the way. We can’t control the weather but we can certainly try to mitigate its effects. When the forecast calls for freezing rain or sleet, be proactive. Pre-treat sidewalks, parking lots, steps and roadways with a liquid anti-icer such as salt brine. Salt brine prevents ice from bonding with surfaces and lowers the temperature at which water freezes. Monitor the storm and reapply as necessary. After the storm a deicer maybe necessary to prevent refreezing. The Cope Company Salt offers salt brine and other salt products that assist in eliminating freezing rain and sleet that is already on the ground. For more information on combating freezing rain and sleet CONTACT US.